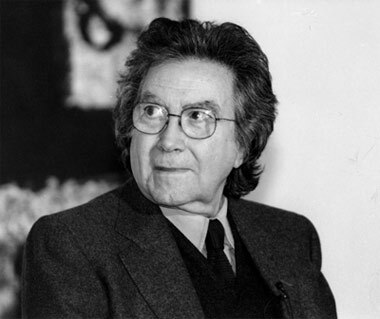 Antoni Tàpies : Born in Barcelona in 1923, Antoni Tàpies is a spanish painter, sculptor, essayist and art theorist. He was marked by the civil war. Since 1945 in a neodadaïst spirit alternating abstraction and primitivism, he worked different materials. Two years later he participated to the creation of the magazine « Dau al Set » and interested himself to surrealist painting. At this time he became friend with Joan Brossa then Joan Miró. Since 1950, he explored an original and varied materiality : latex, emulsions, tars in large layers, oils, marbles and pigments in powder, resins, etchings with suger and carborundum. In the thickness of the substance signs are inscribed which are essential vehicles of his approach : triangles, circles, crosses, letters and numbers, parts of the body. Antoni Tàpies realized many exhibitions through the world (Geneva, Paris, New York, London, Barcelona, Tokyo, Rio de Janeiro, Venice...). He died in Barcelona in 2012.